So, Mr Blair’s out. He’s swapped Prime Ministership to be Steward and Bailiff of the Three Hundreds of Chiltern. Technically, at least. But really, he’s off to be an envoy in the Middle East. Because, of course, everybody respects everything Mr Blair’s done in the Middle East. Especially Iraq. Somebody else’s villa in Barbados. Somebody else’s son in Iraq. For me, it sums up perfectly the relaxed, celebrity, sofa-style of government – and the terrible ultimate consequence that’s overshadowed everything good he’s done. It’s pure Greek tragedy. This 1,164th post was filed under: News and Comment, Politics. Comment posted at 15:11 on 28th June 2007. I just wanted to comment on how happy you must be, now that mad pats out of the cabinet. when I read the articles about her again, it was blatantly obvious how incompetent she was. Hopefully Alan Johnson can repair what damage she has caused, he certainly has his job cut out. Comment posted at 15:48 on 28th June 2007. Hi Gary! I’m glad that Mad Pat’s gone, but the promotion of the Miliblogger is astounding: He’s a first-rate idiot who’s spent the last few weeks insulting Mr Brown, and still ends up with a pretty top job. Why anyone thinks he’s a ‘rising star’ is beyond me. The loss of Baroness Amos is a bad thing – she talks a lot of sense, most of the time. And note that Blair’s burying bad news to the last, news of his latest questioning in a criminal trial coming out the day of the reshuffle. It’s not all bad though. I’m relatively happy to see Jack Straw at Justice, Alan Johnson should be pretty good at Health, Jacqui Smith should make for an interesting Home Secretary (not sure whether she’ll be good or bad), and the lack of a Deputy PM can only be a good thing. 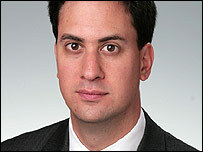 But one thing above all strikes me about this reshuffle: Doesn’t Ed Miliband look remarkably like Ernie? Comment posted at 18:10 on 28th June 2007. 🙂 you’re right he does look like ernie. Hopefully the country will be sorted out soon, especially Iraq and Afghanistan. Comment posted at 20:07 on 28th June 2007. Well, let’s hope so… but I’m not even sure what ‘sorted out’ means any more!